Bamboo can send notifications about build results to Hipchat so you can find out immediately about the success or failure of your builds. ...and many other notification events. Sign up for a Hipchat account. Set up plan notifications in Bamboo that use the 'Hipchat' Recipient type. Install the Hipchat Server's SSL root or primary certificate in <JAVA_HOME>/jre/lib/security/cacerts keystore on the Bamboo host machine and restart Bamboo. Applicable if you're using a self-signed or internally signed SSL certificate. Specify the hipchat.api.url system property that is used when Bamboo is starting, by adding -Dhipchat.api.url=<my_hipchat_url> to your JVM arguments as per Configuring system properties. 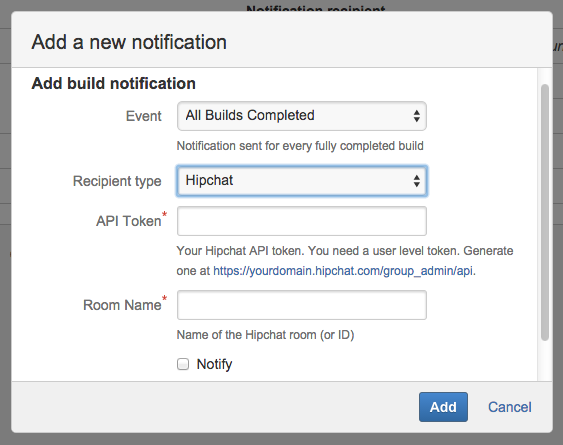 Use a Hipchat V1 token in the API Token field. Choose your Room Name or ID. Check the Notify flag to send pop-up notification to the room. For more information about setting up your own Hipchat server, see System Requirements for Hipchat Server.